Yesterday I recommended the book STEM Lesson Essentials Grades 3-8 as a wonderful resource for any K-8 teacher looking to dig deeper into understanding STEM education. One of my favorite parts of the book is a simple (yet powerful) page that organizes the Practices of Science, Engineering, Technology, and Mathematics in a way that helps us to make connections between these practices. I’ve adapted it into a one page document with some hyperlinks to source documents. 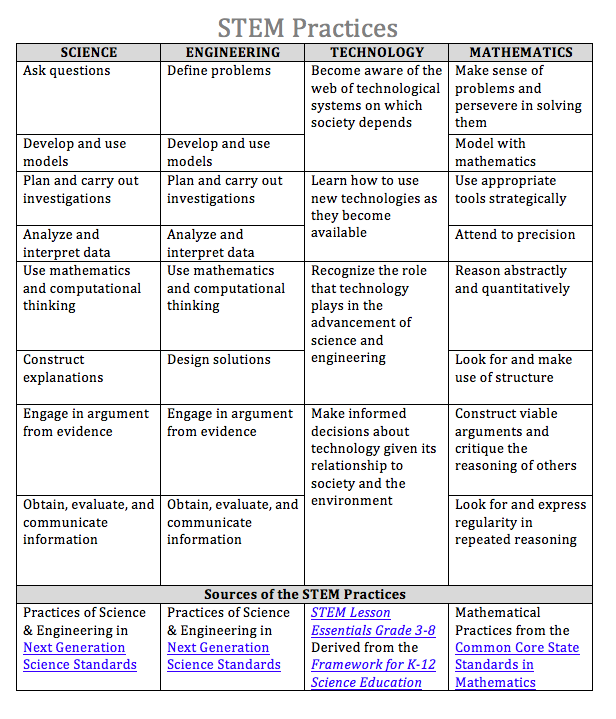 This might be a useful resource of those of you who are building leaders, professional development providers, or teachers looking to design integrated STEM lessons. Enjoy! K-8 teachers of science in Washington state may be interested in a FREE online workshop I created using Udemy.com as a platform. A. I view this as a pilot and would love feedback from participants on what worked for your learning and what could be improved. I hope to create future courses with a better production value. B. This workshop has an intentional focus on the Washington Science Learning Standards. Participants looking for a workshop with a sole focus on the NGSS should look elsewhere. Click HERE to access the course. Enjoy! Well, it’s that time of year where the ongoing countdown of number of days to the end of the school year is reaching single digits for most of us. As such I’ll be posting some recommendations for professional summer reading related to science education in the coming weeks. 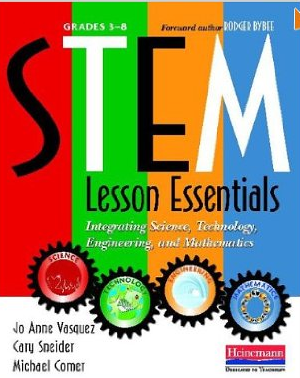 My first recommendation is a new book titled- STEM Lesson Essentials Grades 3-8 by Jo Anne Vasquez, Cary Sneider, and Michael Comer. STEM Lesson Essentials is a timely, readable, and usable guide to STEM literacy that won’t weigh down your beach bag. (At 178 pages it is slim but packs a punch.) See some specifics below. The Front Matter (chapters 1-5) are essential reading for anyone interested in gaining a deeper understanding of STEM literacy and what it means- Every K-8 principal should read this book! Let me know if you would like to join me in a virtual book study over the summer. I’ve only touched the surface on this great resource. Hi all, I wanted to repost about the Grade 5 Science MSP Practice Kit. My post from last year is below. I have received lots of good feedback from multiple schools, districts, and teachers regarding this resource so please give it a look and share. Tom Hathorn of the Bethel School District (here in Washington state) has created a brilliant resource for 5th grade teachers: the 5th Grade Science MSP Practice Kit. This toolkit assembles and modifies many science assessment resources from OSPI into an organized and useable form that pushes beyond “drill and kill” test prep. Student-friendly scoring rubrics and student work samples- These are intentionally NOT identical to the OSPI rubrics. For example- the Writing a Conclusion rubric is based on Claims, Evidence, and Reasoning rather than Conclusive Statement, High/Low Data, and Explanatory Language. Download a copy of the MSP Practice Kit Gr 5 (2012) and feel free to share. I’m hoping this will be a useful tool for several districts, schools, and teachers. Please SHARE BACK any improvements, modification, etc that you make to these materials. Next week I will start teaching K-8 Science Methods courses to three different groups of preservice teachers. In my state, this is typically the ONE science education related course that elementary educators receive. It always feels like a huge responsibility… that in just a matter of hours over the couse of 10 weeks I am charged with conveying all of the necessary habits of mind, pedagogy, knowledge and beliefs necessary to be a successful teacher of elementary science. So on that note, I’m asking all of you to help me out. What would you like to share with this group of emerging elementary teachers regarding science education? Perhaps a bit of advice, a quote, a tip, or a word of encouragement. What do you wish someone would have shared with you? Please leave some thoughts in the comments and I will pass it on. Thanks. Doug Haller posted a piece on SmartBlog on Education titled Early Childhood STEM: Less Talk More Action. The post is well written and makes some important points about the overwhelming focus on literacy and mathematics in K-5 education… a focus that tends to marginalize the importance of science (not to mention social studies, health, and the arts.) Check out the post HERE. STEM-IT is a math science partnership project in Washington state involving ESD 123, ESD 189, and multiple partners. A requirement of the grant is to provide developed resources online. The STEM-IT site currently contains resources for K-5 STEM education that connect STEM literacy, science standards, English/Language Arts standards, and Design Challenges with some common elementary science instructional materials. The site contains tools for providing professional development on the STEM-IT resources. Another great set of STEM materials to add to your bookmarks.